After posting about statement necklaces earlier this week, many of you commented that even though you admire the look, you don't know how to wear it. I decided I would give some advice on how to best pull off the style. 1. Avoid mixing prints with statement necklaces. Solid tops and dresses in simple silhouettes and neutral shades will ensure that your necklace remains the center of attention. 2. Keep your neckline simple. Complicated necklines will interfere with your jewelry. Scoop, V-neck, and crew-neck styles work best to show off your neck area. 3. Limit other accessories. For example, avoid wearing chunky bangles, long dangling earrings, and trendy hair accessories in order to keep the focus on the necklace. 4. Keep in mind the proportions of the necklace and your body. If you're petite, then a necklace that drapes to your waist can make you look shorter. If you're long-waisted, then opt for a longer style. 5. Keep your hair simple and tamed. This will allow your necklace to take center stage. 6. Remember, it's a statement necklace, so let it do the talking. Here is an outfit I put together around one of the necklaces from earlier this week. 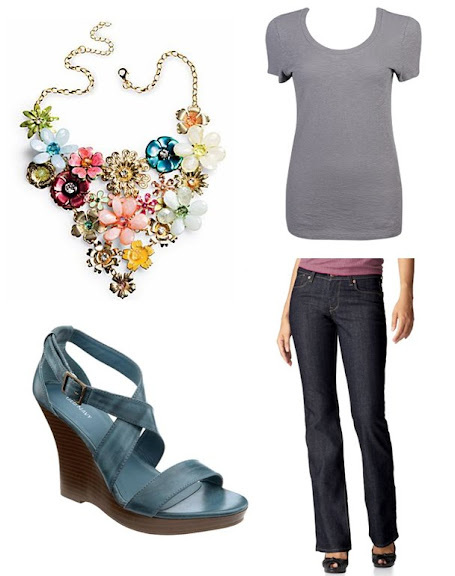 A simple tee and dark rinse boot cut jean make for a great canvas for displaying the beautiful necklace. I added a bit of a punch with the teal platforms that tie into the necklace coloring. So, what do you think of the tips? Does this look seem like something that you could wear? Leave a comment! I really like that necklace! Not sure how it would look on me, but I love how you styled it. Very simple yet trendy at the same time! I absolutely LOVE this outfit! I'm loving the big, bold, funky jewelry that's in style! That necklace was my favorite of the ones you posted originally, and this is really similar to how I planned on wearing it! I was planning to hold out a bit and reward myself at the end of the month, but now I just don't know ... it might sell out ... eek. Anyhow, just wanted to point out that statement necklaces work great under fitted blazers as well and also on top of dress shirts and buttoned-up cardigans (that last one might be personal preference). I realllllyy like this necklace im just worried it will be too big for any normal neckline. would the necklace look good if it overlaps the shirt? shouldnt it only be on bare skin? Love that necklace! Statement necklaces are such a great way to pull an otherwise boring outfit together. @Anonymous - I think your necklace interfering with a neckline (especially if it is a simple one) is totally ok. I often wear my statement necklaces overlapping my shirts. Madeline, I love this outfit! Keep it up, your blog inspires me!!! !